mice are resistant to the effects of GDF15. Figure from Hsu, J-Y, et al1. Four independent research groups recently identified the previously orphan receptor GFRAL as the receptor for GDF15. The simultaneous publications, one in Nature1 and three in Nature Medicine2,3,4, show that GFRAL expression is restricted to brainstem regions in mice and that GDF15 acts through GFRAL to activate a neuronal circuit which causes weight loss under stressed conditions. This "emergency pathway" is involved in weight loss associated with disease such as cancer and other types of tissue damage and stress. All four groups used Gfral knockout mice from Taconic Biosciences in their studies. 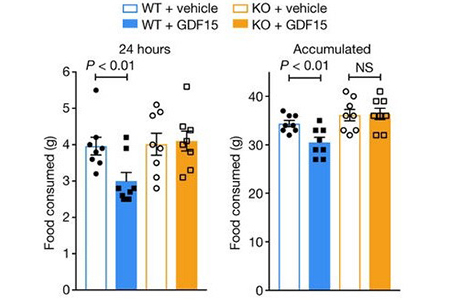 In wild type mice, administration of GDF15 induced weight loss and reduced food intake. These effects were abrogated in Gfral knockout mice1,2,3,4. Administration of cisplatin induces the emergency pathway and weight loss in wild type mice, but Gfral knockout mice were protected from such weight loss, confirming the involvement of GFRAL in this pathway1. These breakthrough new papers all came from pharma researchers (NGM Biopharmaceuticals/Merck/XTAL Biostructures, Janssen, Eli Lilly, and Novo Nordisk), indicating this pathway may become a hot new target for weight control therapeutics. 1. Hsu, J.-Y. ; Crawley, S.; Chen, M.; Ayupova, D. A.; Lindhout, D. A.; Higbee, J.; Kutach, A.; Joo, W.; Gao, Z.; Fu, D.; To, C.; Mondal, K.; Li, B.; Kekatpure, A.; Wang, M.; Laird, T.; Horner, G.; Chan, J.; Mcentee, M.; Lopez, M.; Lakshminarasimhan, D.; White, A.; Wang, S.-P.; Yao, J.; Yie, J.; Matern, H.; Solloway, M.; Haldankar, R.; Parsons, T.; Tang, J.; Shen, W. D.; Chen, Y. A.; Tian, H.; Allan, B. B. Nature 2017. Epub ahead of print. 2. Mullican, S. E.; Lin-Schmidt, X.; Chin, C.-N.; Chavez, J. A.; Furman, J. L.; Armstrong, A. A.; Beck, S. C.; South, V. J.; Dinh, T. Q.; Cash-Mason, T. D.; Cavanaugh, C. R.; Nelson, S.; Huang, C.; Hunter, M. J.; Rangwala, S. M. Nature Medicine 2017. Epub ahead of print. 3. Emmerson, P. J.; Wang, F.; Du, Y.; Liu, Q.; Pickard, R. T.; Gonciarz, M. D.; Coskun, T.; Hamang, M. J.; Sindelar, D. K.; Ballman, K. K.; Foltz, L. A.; Muppidi, A.; Alsina-Fernandez, J.; Barnard, G. C.; Tang, J. X.; Liu, X.; Mao, X.; Siegel, R.; Sloan, J. H.; Mitchell, P. J.; Zhang, B. B.; Gimeno, R. E.; Shan, B.; Wu, X. Nature Medicine 2017. Epub ahead of print. 4. Yang, L.; Chang, C.-C.; Sun, Z.; Madsen, D.; Zhu, H.; Padkjær, S. B.; Wu, X.; Huang, T.; Hultman, K.; Paulsen, S. J.; Wang, J.; Bugge, A.; Frantzen, J. B.; Nørgaard, P.; Jeppesen, J. F.; Yang, Z.; Secher, A.; Chen, H.; Li, X.; John, L. M.; Shan, B.; He, Z.; Gao, X.; Su, J.; Hansen, K. T.; Yang, W.; Jørgensen, S. B. Nature Medicine 2017. Epub ahead of print.